In the Manchester area, Tatton Hall, Bramall Hall, Lyme Hall and Heaton Hall are the most famous local mansions or houses that were once the homes of the rich and influential families. But there are smaller and less famous halls that are often forgotten and overlooked. Each one has a unique appearance and a fascinating history. Clayton Hall is a suprisingly well preserved 15th century house in Clayton east Manchester. It’s a Grade II* listed building, one of six ancient monuments in the City of Manchester. I was very impressed with the exterior which is remarkably photogenic. What makes it unique is its moat and the stone bridge across it. I understand there are plans to fill the moat with water. Clayton Hall functions as a Living History Museum and there are events throughout the year. Now that there is a Metrolink stop named after it, there’s no excuse not to visit! Hough End Hall in the shadow of an office block. Hough End Hall is a medieval hall in south Manchester. It was built at the end of the 16th century and is also Grade 2* listed. It was the home of the wealthy and influential Mosley family. Mosley Street in Manchester City Centre was named after them. 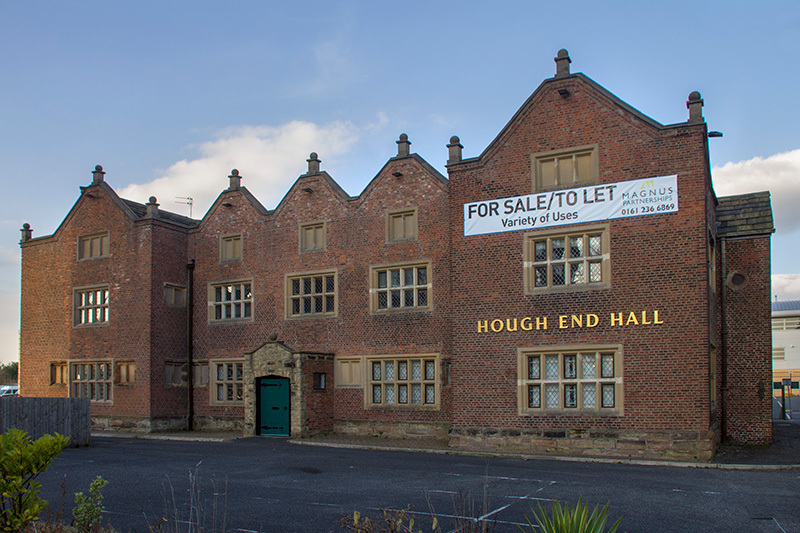 Sadly two modern office buildngs were constructed on both sides of Hough End Hall, blocking the sun from falling on its façade. It is currently up for sale. The Metrolink line to Manchester Airport passes close by. Baguley Hall is a medieval house that was built in the 14th century about two miles south of the river Mersey in Cheshire. In 1931 this area became part of the City of Manchester and the surrounding area became known as Wythenshawe. It’s a Grade 1 listed building and is owned by English Heritage. As I was taking the photograph, a local resident told me it has an impressive wood ceiling inside. It’s one of Manchester’s Ancient Monuments and is on the ‘buildings at risk’ register. Longford Hall was the home of the cotton magnate and philanthropist John Rylands. His wife Enriqueta gave Manchester the John Rylands Library in his memory. The hall was built in 1857 and was run on a lavish scale. Later the hall passed to Stretford, then Trafford and was in use until quite recently. Due to unfortunate circumstances the house was lost and only the entrance portal remains. We can only imagine its former magnificence. There are plenty of photos available online. Longford Park has an enthusiastic friends group. Let’s not forget Agecroft Hall, which was bought by a wealthy American in the 1920s, shipped across the Atlantic and reconstructed in Richmond Virginia where it is a tourist attraction today. Search for Agecroft Hall to find the official website.